The Eastover creates a sense of volume and spaciousness from cathedral, vaulted, and nine foot ceilings throughout the first floor. Built-in bookshelves flanking a cozy fireplace and interior columns add elegance to the great room, while a cathedral ceiling with a palladian window in a gabled dormer add volume and style. The private master get-away has all the extras, including a bath with garden tub, picture window, double bowl vanity, enclosed toilet, and walk-in closet. Upstairs, two bedrooms share a roomy bath with a cathedral ceiling. Storage abounds with linen closets, storage closets, and attic storage. 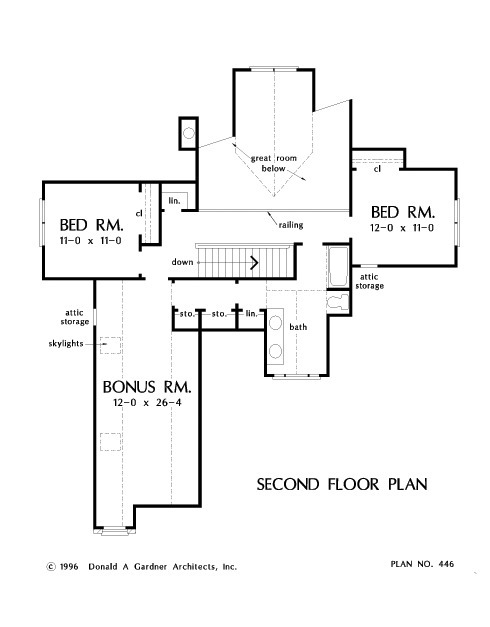 A skylit bonus room is easily entered from the second floor hall and accesses the bath for extra convenience. 1st Floor: 1644 Sq. 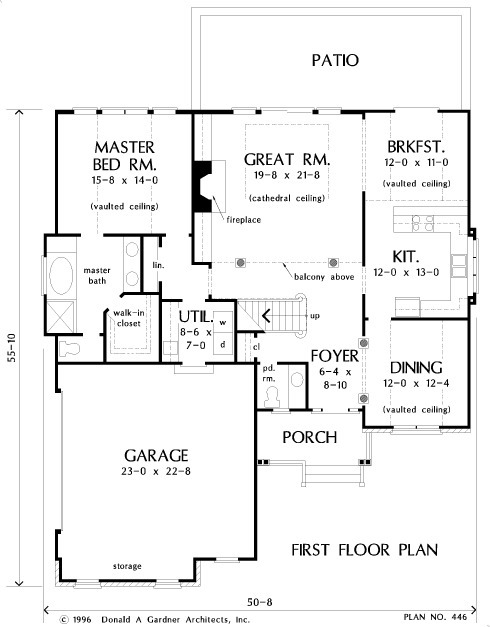 Ft.
House Dimensions: 50' 8" x 55' 10"
Great Room: 19' 8" x 21' 8"
Master Bedroom: 15' 8" x 14' 0"
Dining Room (Vaulted): 12' 0" x 12' 4" x 12' 11"
Great Room (Cathedral): 19' 8" x 21' 8" x 23' 6"
Breakfast Room (Vaulted): 12' 0" x 11' 0" x 11' 11"
Utility Room : 8' 6" x 7' 0" x 9' 0"
Bonus Room : 12' 0" x 26' 4" x 8' 0"
Garage : 23' 0" x 22' 8" x 0' 0"
Garage Storage : 15' 5" x 2' 6" x 0' 0"
Master Bedroom (Vaulted): 15' 8" x 14' 0" x 13' 7"
Porch - Front : 12' 4" x 6' 6" x 0' 0"
Deck / Patio : 30' 8" x 11' 0" x 0' 0"
Balcony : 17' 8" x 4' 0" x 8' 0"
Storage (Other) : 2' 10" x 2' 0" x 8' 0"
Storage (2nd Fl.) : 4' 0" x 2' 0" x 8' 0"
Foyer : 6' 4" x 8' 10" x 9' 0"